Diamond D Company in Capitola, CA. Learn more about the staining process. However, there are several things that can go wrong. The fact that stain is permanent also means that mistakes are permanent. "Even staining specialists with years of experience can encounter problems from time to time," says Chris Sullivan, vice president of sales and marketing for ChemSystems Inc. When applying stain to either new or existing concrete, understanding the basics — from surface prep to final sealing — are vital to a successful outcome. The tools for staining are fairly basic, although acid stains will require acid-resistant brushes and spray equipment. The difficulty comes in knowing how to apply the stain correctly with those tools. Applying stains with mops, rollers and squeegees should only be done by experienced contractors because they can leave undesirable roller marks or streaks of color. Whether you’re staining new or old concrete, thorough surface preparation is essential. New concrete must be fully cured before applying stain, and existing concrete can present any number of problems depending on its exposure to weather, spills or chemicals and the type of wear it has received. Unlike paints and coatings which are opaque and can mask many evils, acid stains are translucent. Any residue remaining on the surface of the concrete is likely to be visible through the stain. When done properly, surface preparation dramatically impacts the finished appearance of the project, and can affect it just as dramatically if done incorrectly. Surfaces can be prepped in two ways, either by mechanical grinding or with the use of a specially formulated cleaner. However, cleaning concrete with muriatic acid (acid washing) before acid staining depletes the lime in the concrete, preventing acid stains from reacting properly and producing the desired color. Knowing the best prep method for your project is critical. Acid-based stains have different requirements than water-based stains for surface preparation, application and cleanup. Acid stains react chemically with the concrete and create a permanent chemical bond. Other, non-reactive, stains produce color by bonding to the concrete surface, filling the pores of the concrete and producing a colored film or coating. Before starting your project, you’ll need to know which type of stain is better suited for your application. When working with acid-based chemical stains, it’s important to be aware of proper precautionary measures as they often contain corrosive components that can cause eye and skin irritation and produce strong odors. This should also be taken into consideration when deciding between acid- and water-based stains. There are applications, such as enclosed basements and locations without proper ventilation, where water-based stains should be used because of the chemical exposure. Keep in mind that once the stain is down, the color is permanent and there's no going back. Color samples should always be done on the concrete you plan to stain to get a truer representation of how that particular surface will take the stain. Unlike paint, stains penetrate the surface, making future color changes quite difficult. Surrounding areas must be carefully masked off to avoid unintentional staining since acid stains can be tough and sometimes impossible to remove. Be careful when masking, because adhesive from tape may pull color off concrete that has already been stained or leave behind a residue that prevents the stain from reacting properly with unstained concrete. Stained concrete should be sealed for protection. 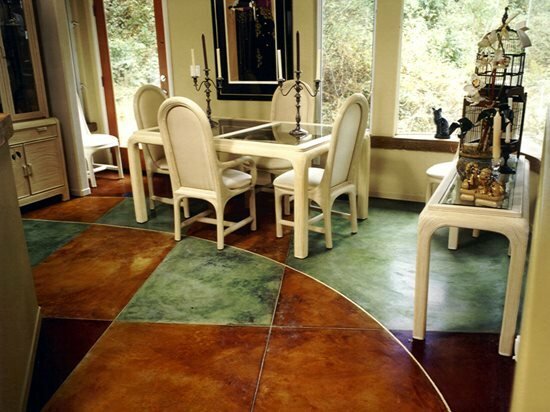 Sealers will vary based on their compatibility with the stain that is used. Acid-based stains require residue to be removed and the surface to be neutralized with T.S.P., baking soda or ammonia before sealers can be applied. If this is not done properly, your sealer won’t be able to form a proper bond with the concrete. Ambient conditions such as temperature, humidity and air flow can affect the drying and curing times. If you’re still convinced this is a job you want to take on, here’s more information on How To Stain Concrete. But, if you have any doubts, especially if the slab is large, requires extensive surface preparation, or incorporates multiple colors and elaborate decorative effects, you should hire the services of an expert.